Artwork Panel: 49.7cm x 97.8cm ≈ 19½" x 38½"
Silk/Brocade: 58.8cm x 152.8cm ≈ 23" x 60¼"
Width at Wooden Knobs: 67.8cm ≈ 26¾"
This scroll has the classic style and theme of traditional China. 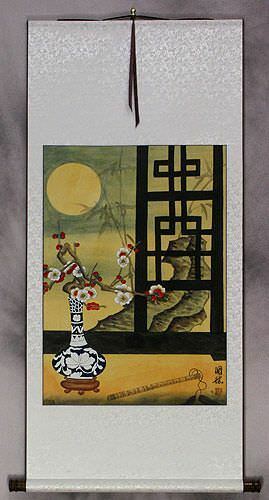 The title means, "Light Breeze in the Autumn Moon." 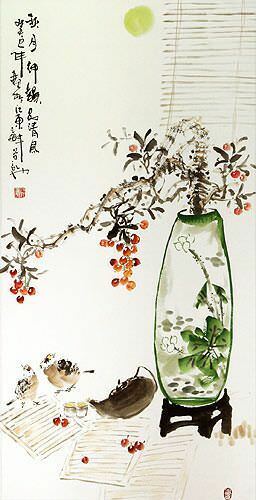 The artwork features a plum blossom in a vase along with all the articles needed to write calligraphy (blank books, calligraphy brushes, an inkwell, and of course a teapot). At the left, a couple of birds are visiting. Where did I get this art? 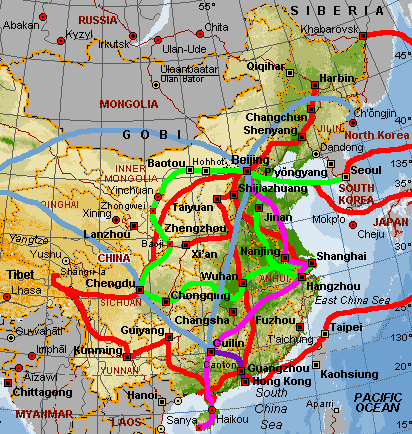 Here's a typical art-buying trip that extended through thousands of miles of China (You can look at the bright green line on the map to the left). After a quick trip to South Korea, my real travel begins in Beijing with a train ride through Inner Mongolia, only to find that art is not abundant there, but ice and cold weather certainly are. Trips before 2004 are shown in red. Latest trips & common routes are shown in other colors. Heading south, though Ningxia Province, I stop in a little town called Zhongwei, where I meet one of the top Chinese calligraphers in the world. Meaning to only spend a day or two in this town, I spend the better part of a week with this talented calligrapher with lots of meals, tea, beer. My next stop finds me tooling around a dune-filled desert on a camel. I think the jeep option would have been better. Heading further south, I stop in Baoji in the Shaanxi Province, only to find an industrial city, devoid of art, although I am able to pick up a few traditional "wood rubbings" from an artist in a village outside of town. Time to go again, and with the purchase of another train ticket, I make my way to Sichuan Province. The home of the spiciest Chinese food on the planet. The kind of food that will burn holes in your stomach. If you come to Sichuan with ulcers, the food here will either weld your ulcers shut, or kill you. My first stop in Sichuan is another dead end, but my second stop is Chengdu, the capital of Sichuan. I find that artists are multiplying in Chengdu, and perhaps there are twice as many artists to meet here now than there were just 9 months ago on my last trip. With a belly full of spicy food, and a backpack full of thousands of dollars of Chinese art, I head east via long-distance bus to Chongqing (you might know it as Chung King). A huge metropolitan area that has collided with the villages around it. Again a dead end, but interesting to see old clash with new, as skyscrapers rise in the shadow of shacks and homes that are hundreds of years old. I am torn in Chongqing as to where I should go next. 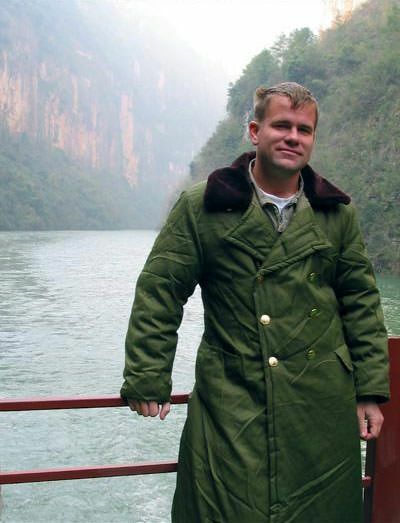 I think about flying to Guilin, but am suddenly struck with an idea to grab a riverboat and head down the Long River (or "Chang Jiang" which means "Long River" in Chinese - often known as the "Yangtze" in the west, though the "Yangtze" or "Yangzi" is just one section of the Long River), and see the Three Gorges before the largest dam project in the world seals them under water forever. ...but I wasn't fooling anyone. One look at me, and you know that I am certainly not a Chinese soldier. so there was nothing they could do about it. The load on my back is getting heavy, and that is no way to travel on small boats and ships as you journey by the seat of your pants down river. So, I send two heavy boxes of Chinese art back to my partner Sandy in Beijing via "rail freight". Hopping from boat to boat for 4 days, I make my way down the river. Even bribing my way onto a very small ship that was apparently operated by the Chinese Navy. Past what will be the largest dam in the world when fully operational in 2009, I arrive in Yichang, which is not far from Wuhan, in Hubei Province. The train and air travel from Yichang is limited, and I can not go directly to my next destination, I head to Shanghai, a wild city, and one of the most expensive places in all of China. Shanghai is like no place on earth. Walk down one street and you will be greeted with the sight of 100 pair of underwear hanging from an apartment building to dry. Cross the river to Pudong, and only the glass and steel of modern skyscrapers fill your eyes. With the crazy lifestyle of Shanghai behind me, I head to Jinan, in Shandong Province where I meet many artists. Of more than 30 artist's studios that I visit, I pick only 5 artists whose work is of the quality and style that I am looking for. After several days in Jinan, and with a backpack heavy with art, I head home to Beijing, where all of the art that I have purchased during my trip will be mounted to create wonderful portraits and scrolls.